It is important to choose the right tools to relate abstract themes (such as competences, strategy, values, etc.) to the daily behaviors and activities. Our dialogue methods help in the best way to involve various levels of organization into a debate on how to carry out innovations and link values, codes of conduct, standards, strategies, etc. with the daily work of employees. These formats have successfully worked several times in organizations in Scandinavia and the Baltics, in large, small, public and private sector institutions alike. We are also using a wide range of internationally well-known measuring tools in our training and consulting projects. Organization studies and psychological testing of certain characteristics in both teams and individuals make development and counseling more meaningful and more personal. Value Game is a playful format that helps to develop and introduce organizational culture. Excellent tool for effective involvement of many people in a very short amount of time. 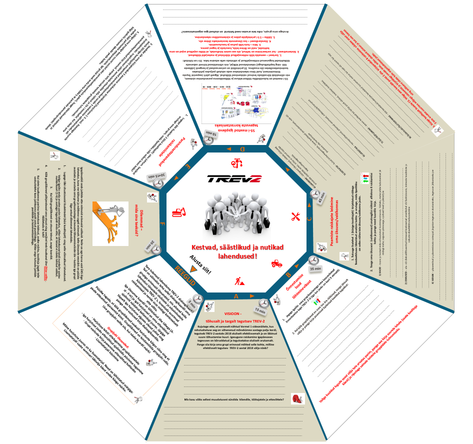 Teaching tool in a game table format that allows the organization to carry out a systematic consultation with employees with regard to occupational safety. Playful dialogue format that can be used at different levels in the organization to carry out a systematic discussion with managers about occupational safety. Development tool with a serious content and a fun form, in the development of which several Estonian companies have been involved. Simulation game that illustrates how different types of people behave in the face of change. A set of change management tools put together for managers based on the experience of working with many organizations and on the best scientific sources. LEAN game will help you focus on how to create value for the customer. Potential Dialogue™ – learning tool in a board game format for finding hidden potential and planning development. Management Action Profile™ measures the efficiency of managing by the managers and the success of teams in key areas using the 360-degree method. A unique 180-degree evaluation tool designed for the development of the sales staff. DiSC® is a model that explains human behavior and describes different behavioral preferences and behavioral style arising therefrom. Team assessment tool that helps to find out where a particular team stands according to the key indicators of the Lencion model.